2006-03-20 - Version 2_4_0 is now available. · Added Super Lookup module for using a fast external database to lookup calls and place names. AWESOME! · Changed the Peer buttons on the Station Info window to Pass buttons. Click on one of them and the Pass window pops up all filled out for you. COOL! · Made it so the external band switch command is not executed when editing a QSO or at other times when we're not really changing the band of operation. · When logging a QSO with "real time" selected, update RoverLog's time just before committing the QSO to the log to prevent time freezes from occurring in the log. · Changed all band references from 903 to 902 to meet Cabrillo standard. · Removed "LIGHT" band references. The Cabrillo standard calls for "300" to be used for laser QSOs. · Made contest .ini file selection a menu in inied.tcl. 2006-01-18 - Version 2_3_3 is now available. · Fixed a syntax error in rotor.tcl that would cause the module to start up with a blank window and fail to operate. · Made it so the Keyer can operate without serial ports, i.e. blank settings. With this set up, you'll stomp on a foot pedal or use some other means to key the radio, and then trigger the keyer separately. · Made it so the keyer comes up with the "mygrid" setting from its .ini file as the "sent" entry by default. · Fixed a bunch of syntax errors in the Rig Module that would make it fail to interface to any rigs properly. · Corrected the manual's discussion of saving mixer settings using the QuickMix external mixer program. · Added a statement to the manual indicating that RoverLog stores all of its files (including logs) in the installation folder/directory. · Made it so the installer places a shortcut to the RoverLog folder on your desktop as a further clue to where the log ends up. 2005-10-08 - Version 2_3_2 is now available. · Resizing main window vertically now makes the log stretch vertically. · Alt-W in sked window now clears all appropriate fields. · F12 now also scrolls log display to the end in addition to returning to the call field. · Keyer now checks for valid looping delay before scheduling loop. · Module windows are now fixed size. · If WinKey or voice keyer serial ports do not open, a popup is displayed. · Verified that when I hit spacebar from the call field and a grid lookup is performed, the whole Received Grid field is highlighted, but when a lookup is not performed, the cursor returns to the last insert location. · Alt-W and/or a different call in the Call field reset grid lookup so it is performed the next time the cursor is moved to the Received Grid field. 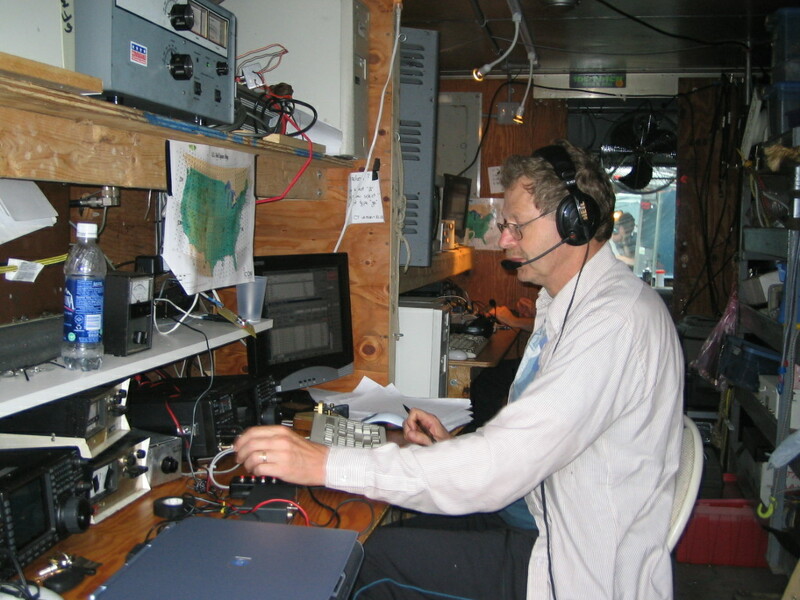 · When Band Lock is on, we no longer copy a QSO's band with "Copy QSO", we instead retain the current band. · Added selection for Green Heron Engineering RT-20 rotor controller in Rotor Module. This uses the Hygain DCU-1 protocol, so it's an alias. · Added RC2800DC-alt syntax which sends A####.#[CR] instead of A[CR]####.#[CR] like the older RC2800DC protocol. · Added a mechanism for the Keyer Module to accept CW message macro parameters without commanding a message to be sent over the air. · Added the custom CW message field to the Main RoverLog Keyer window with some appropriate shortcuts (Alt-W clears, Enter sends). · Made it so custom CW messages sent from the Main RoverLog Keyer window can contain macros. · Added antenna offset for offset feeds or random rover vehicle orientation. See the manual for an explanation on how to use this feature. · Added ADIF log exporting. · Added configurable delay between opening voice keyer serial port and fconfiguring it. This is to help handle slow USB serial ports. 2005-09-08 - Version 2_3_1 is now available. Sorry about this release, but I just can't keep my hands off RoverLog. This is NOT a bugfix release, just some minor "improvements". Please download the updated manual and Quick Reference. · Added a band menu button for the map window. · Added a flag to enable/disable changing the My Call and Sent fields. · Added yellow highlighting for important fields. 2005-09-07 - Version 2_3_0 is now available. · Added the ability to call an external program when changing bands. This allows interfacing with the N3FTI parallel port interface via an external command line IO Port write utility (see next item). For information on the N3FTI interface, see http://www.qsl.net/n3fti. · Added a small command line utility "iopwr" that allows writing a value to an IO port such as the parallel port. See the manual and README_iopwr.txt for more details. 2005-08-24 - Version 2_2_8 is now available. · Made RoverClk background colors configurable in inied.tcl. Goofy. · When comparing QSOs for Rover checking, FN13 vs. FN13ec would cause RoverLog to prompt to log as a Rover. This is now fixed. · Added a manual grid field to the calculator window to allow bearing calculation without disturbing the QSO entry fields. · Added advance warning for skeds to warn you BEFORE each sked comes up. · Fixed the network logging UTC offset error for received messages. · Looked for WinKey problem only playing part of a CW keyer message. Cannot find a problem here. Need help to reproduce. · Disabled resizing RoverLog windows unless there is a meaningful way to do so. · Made resizable windows expand/contract list or text areas. · Added note in manual suggesting turning up the Auto Save Interval for large stations that experience lagging performance later in the contest. If you set the Auto Save Interval to 5 instead of 1, the log will be saved with every 5th QSO vs. every QSO. This should prevent a lot of slow down. Note that if you change the interval to a number larger than 1, you need to be careful to save your log before exiting. 2005-06-28 - Version 2_2_7 is now available. · Corrected bug with calculating time when sending a network message. · Omit blacklisting myself when sending a network message. 2005-06-28 - Version 2_2_6 is now available. · Made incoming net logs stop changing the lookup results and the map center. · Made logging a QSO only scroll down when logging if the view is already at the bottom. This prevents unwanted scrolling while reviewing the log. · Made band lock prevent F-Key QSYing. · Made updates for WIP, etc. happen periodically instead of by exception. This should help keep these items much more up to date, especially on crappy network segments. · Made keyer stop looping with WinKey when CW keying is stopped. · Made modules ask for exit confirmation if exiting via user action (vs. network exit command). · Made first spacebar out a new call select the whole received grid field instead of putting the cursor after the grid. 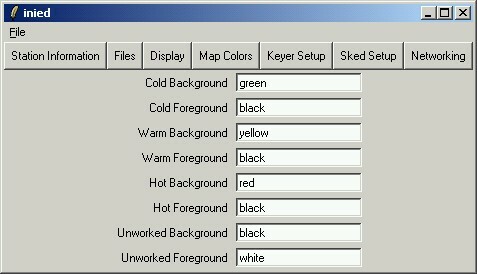 Successive spacebars for the same call do not change the received grid and place the cursor after the grid. · Added a state machine for looking up the received grid square from the callsign when moving from the call field to the received field. If the user typed something in for the received grid, it is locked so that the lookup is not performed until the QSO is logged, even if the call changes. · Made module icons different for easy identification in the Windows taskbar---cool! · When the user quits a module, we now ask "are you sure?" It would be bad to exit a module RoverLog is depending on. · We now use a red color if the user has WIP to work (passes or skeds that have come due). · We now flag net messages sent to all as such on reception so they don't look unicast. · We removed the Alt-g, Alt-r, and Alt-q shortcuts to prevent accidents. · Smartened up many startup and incremental algorithms to reduce startup and net service time. RoverLog used to take a LONG time to start up. It turns out that the major time hogs on startup were insertion of QSOs into the log list and dupe lookup to protect the integrity of the internal lookup database. With improvements in these two areas, startup time on my machine was reduced from 24 seconds to around 4 seconds for a 2.25 million point log. · Added progress indication for loading in log. Not sure if I like this. Feedback welcome. · For Keyer, added speed pot readback and update for WinKey so speed can be dynamically controlled during WinKey playback---very cool. · For Keyer, made it so characters sent via the physical paddles are inserted into message 6 (the scratchpad message)---awesome. · Made blacklisting for non-peer items much more visible with every item shown via a red button or other widget on the main window. · Made GPS Module non-blocking to make operation more responsive. This helps A LOT! · Made GPS Module blank fields if no GPS data is detected for 10 seconds. This will cause the main RoverLog program to blacklist the GPS module and make it clear that something is going on. · Made RoverLog always get its time from the PC clock instead of optionally from the GPS Module. This is safer. See the manual. · Made the GPS Module warn the user if the GPS time and the PC time are off by a lot (> 10 sec). This shows up as the time set Enable button colored red. · RoverLog now shipped with smaller Freewrap 6.0 instead of 5.61. · Added operating Mode to Rig Module capabilities and RoverLog main program reporting. Works for Icom, need testers for Kenwood and Yaesu. · Removed UTC Offset setting. This can be calculated internally to the Tcl interpretter to remove human error. This means users no longer have to set this and the PC time can be set to any time zone but RoverLog still knows how to refer to everything in terms of UTC. RoverClk, the GPS Module and the main RoverLog program were affected. · Added option to omit log sort buttons from the main window if desired. I hope you had as good a time as I did during the June contest! I operated again at the famous W2SZ atop Mt. Greylock in Western Massachusetts. We used RoverLog there for the third or fourth time. We added WinKeys and voice keying on some stations, and things worked well. I got a lot of feedback! 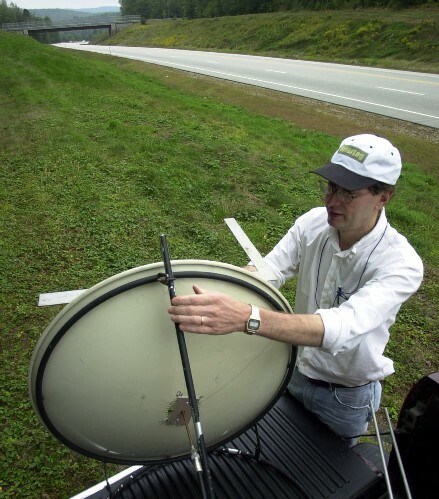 I also heard that N2PA used RoverLog for the first time---great job, guys! 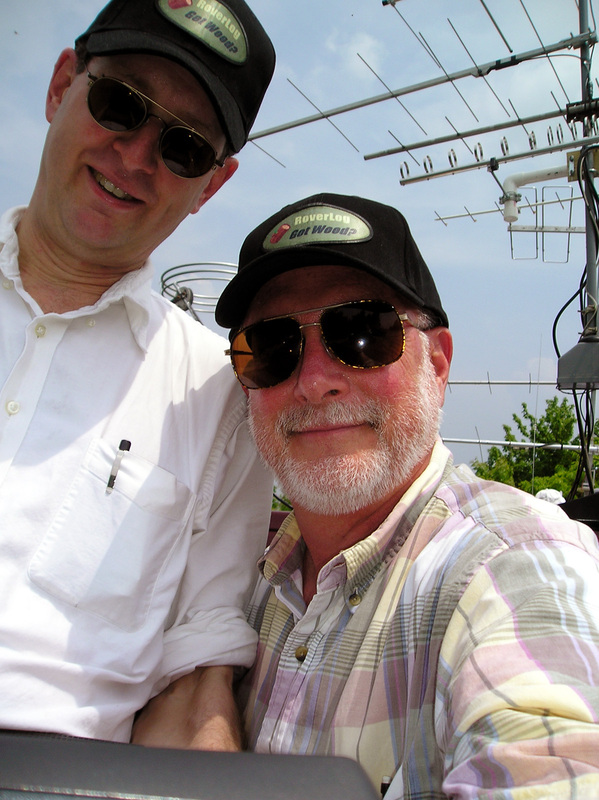 Here is a photo of N1FGY/R and K2LM (nice hats!) and here’s one of K2TR operating the 50 MHz seat at W2SZ. If you have photos of you and RoverLog, send them along. RoverLog was mentioned in the July issue of QST in “The World Above 50 MHz” on page 80. We’re famous! Wait until you see all of the goodies I am fixing and adding to the next release of RoverLog. It’s going to be the best release ever! 2005-06-08 - Version 2_2_5 is now available. · Made keyer wait 500 ms before sending WinKey initialization message after setting handshake lines to allow power from serial port lines to settle. · Corrected "hang" bug when setting computer time in GPS Module. · Added setting computer time in GPS Module under Linux. 2005-06-07 - Version 2_2_4 is now available. · If a network peer is blacklisted, still try to communicate next time. There is no delay now because of the callback method used when opening outgoing sockets. · Send messages to peers in non-blocking mode to prevent the unlikely possibility that the socket open works but the send does not. 2005-05-28 - Version 2_2_3 is now available. · Fixed bug when looking up last grid for known stations where multiple grids would appear in the Recd field on the main window. · Added a check for the contest ini file to prevent an exception when trying to source that file. 2005-05-08 - Version 2_2_2 is now available. · Made spacebar bring you back to the last cursor position in the call and recd fields. · Made peer communications use a new -async option to further reduce networking delays. · Added option for received grid lookup (when going out of the call field) to only fill in the recd grid for worked stations. 2005-04-15 - Version 2_2_1 is now available. · Corrected Keyer state transitions when changing between Transparent and WinKey CW keying. · Improved checking when making a pass for out of touch destination peers. · On each window, made default action buttons for <Return> light red to denote action. · Made map redraw more robust. 2005-04-11 - Version 2_2_0 is now available. · RoverLog now displays lookup database information in addition to information from QSOs in the lookup window in Buddies mode. · K1EL WinKey support added to Keyer! This allows you to play real-time CW using the WinKey interface without building the CW detect circuit. The WinKey can be purchased for $28 from http://www.k1el.com/. · Added support for executing an external mixer program upon keying and dekeying using RoverLog's Keyer. This can allow you, for example, to send the microphone input of your PC to your rig interface when RoverLog is not keying. The author of QuickMix has given permission for this fine program to be included with RoverLog. See README_QuickMix.txt in the distribution for more info. 2005-04-03 – Sprint <contest>.ini Files Available! I’ve made the following <contest>.ini files available in time for the Spring Sprints. Click your right mouse button over each file and download to your RoverLog folder. These will be a permanent part of the normal RoverLog distribution from now on. 2005-04-03 – WinKey and external mixer support to be added soon! New look and feel for the Keyer, as well as two new features! I’ve begun work to add K1EL WinKey support to RoverLog’s keyer. Please see http://www.k1el.com/ for more information on WinKey and other K1EL products. This will bring real CW keying to RoverLog finally. I’ve also added the capability to call an external mixer program to set enable/disable the PC microphone and control audio levels when keying and not keying. This will allow you to use your PC’s microphone for driving your radio to reduce complexity of the audio interface between RoverLog and your radio. Version 2_2_0 will be out as soon as I receive my WinKey and make sure everything works properly. I’ve also asked the author of QuickMix for permission to include this fine program as part of the RoverLog distribution. 2005-03-28 - Version 2_1_7 is now available. Please read the README.TXT file and the information below before installing. · RoverLog now displays lookup database information in addition to information from QSOs in the lookup window. · Made Keyer Module properly load voice messages on opening a file. 2005-03-21 - Version 2_1_6 is now available. · Module .ini files are no longer overwritten on install without explicit request. · Corrected internal error when logging a dupe. · Added check for modules already running on startup. · Added module stop on RoverLog exit. · Now the lookup list is updated on logging a QSO. · If the band is locked, the WIP band is ignored on WIP acceptance. · Made File->New always ask for confirmation. Alt ... Enter Enter used to wipe out log without warning due to File->New default menu pick. · Made accepting WIP push accepted WIP into Alt-Z call stack. · Remove stations from WIP if worked without accepting. · Added auto-save of module .ini files on module exit. · Shortened window titles to better see what windows are in taskbar when minimized. · Operator name setting is removed from roverlog.ini. · RoverLog only sends 4-digit grids to Keyer now. 2005-01-21 - Version 2_1_5 is now available. This is for multi-op users. · Made new network multipliers display in the log in the correct color. · Made it so that if I hear from a blacklisted network station, I unblacklist him. This prevents perceived network problems between multiple peers due to blacklisting. 2005-01-20 - Version 2_1_4 is now available. This is mostly for multi-op users, but there are a few minor generally-applicable changes. · Changed F10 and F11 to QSY to bands 9 and 10 if set for QSY (vs. Keyer). · Changed F12 to go to call field (instead of F10). · Added Buddies lookup button below Lookup button. Alt-Key-L still works too. · Added Speed and Course fields to Calc and GPS server for Rovers to line up with. · Made Pass window go away after entering a pass for myself. It already went away when making a pass to someone else. · Made Sked/Pass Freq come from the Peer's Operating Freq on Popping up Pass or Sked. · Made Sked window "now" redraw for the next time increment. Passes are for the true "now". · Frequency before refreshing to avoid wiping out manually-entered values. · Made left and right bracket work to toggle through peers when focus is in the sked list. · Added an entry for enabling/disabling sound card access in the keyer since it is still meaningful to have the keyer in case you have a TNC or other device that will key CW based on serial ASCII input. 2005-01-18 - Version 2_1_3 is now available. This is mostly for non-windows users, but there is also a fix for restoring subwindow locations. · Fixed keyer to allow sound for Darwin (MAC OS). · Fixed roverclk to skip setting the -topmost attribute if not under windows. · Fixed RoverLog to correctly restore subwindow locations even if spawning other modules. · Changed default serial port for Darwin (MAC OS) to /dev/cu.USA19QW11P1.1. 2005-01-18 - Version 2_1_2 is now available. This is a fix for Non-Windows users. · Added a check for OS version in the module spawner to allow modules to start properly under non-windows OSs. · It seems like sub-window location restoring is broken again, at least under windows so windows people may wish to stick with 2_1_1 if this works for them. 2005-01-15 - Version 2_1_1 is now available! · Fixed multiplier display in log window to work properly. It was a color for non-dupes before, not new multipliers like it should be. · Fixed score redraw to give the bottom line in the entry to the bottom left of the main window again. I had stopped the score from being calculated to try to save CPU after each entry, but I think it's better to have this displayed. · Added user configuration of log colors for new multipliers (net and local). · Made F1-Fn selectable between QSYing to Band 1-n and playing Keyer message 1-n.
· Somewhere previously made Alt-Key-b QSY up and Alt-Key-B QSY down. · Added buddies lookup function Alt-Key-L (Alt-Key-l is still partial lookup). Enter buddies in inied.tcl. 2005-01-08 - Version 2_1_0 is now available! · Added keyer play buttons to the RoverLog keyer window. Removed IP address and port from this dialog. · Added the ability for RoverLog to start its modules (gps, keyer, rig, rotor, roverclk) on start up. · Corrected setting RoverLog window locations on startup. · Added capability for modules to store and restore locations. 2005-01-08 - Version 2_0_2 is now available! This is a bug fix release correcting bugs with skeds and the keyer in 2_0_1. · Changed bad reference to Sked_Check to Check_Sked. · Corrected arguments to Add_WIP in Update_Both that had caused an error when a sked was moved into WIP. · Moved voice keying into external keyer where it is supposed to be. · Removed left-over keyer references. 2004-10-21 - Version 2_0_1 is now available! · Removed unused "Partial" button and converted remaining lookups to partial. · Corrected the magnetic bearing calculations. 2004-10-15 - Version 2_0_0 is now available! · Added "annbell" option to enable/disable the bell on annunciator (info) messages. · Added "quicklookup" option to enable/disable hiding the partial window upon pressing one of the "Copy" buttons. · Made Alt-Key-A binding accept WIP in all windows. · Added HCO Light. Warns you if you have typed in the Call or Recd Entry or changed bands without logging. · Made grid lookup only happen once so that what you typed for a received grid does not get wiped out if you furiously hit spacebar like some ops. · Only do a partial lookup if the call has changed. · Only do a bearing calc if the recd grid has changed. · Made the Info field shorter, thereby shrinking the entire main window. · Return entries to old values on Cancel Edit (instead of leaving edit values in). · Display WIP, limit, and busy timer in Sked window. · Display only one Net Log entry for messages sent to all. · Highlight messages for me in the Net Log. · Added magnetic bearing and reverse to calculator disp. · Made the arrow keys work in the Sked List. · Made network-initiated redraws of the Sked List leave the list and selection alone when done. · Made spacebar from the call and recd fields act better. It doesn't select the entire field any more, but if there are question marks in the field it selects the first one. · Established the concept of "blacklisting" the various network connections (keyer, gps, rotor, rigs, and peers) so that if they do not work once, they are not tried again until the operator un-blacklists them. This should prevent misconfigurations or faulty networks from slowing RoverLog down. · Made a simpler Pass window that can be used instead of the Sked window for immediate passes. This also uses a different net message to prevent timing issues from dropping passes. In other words, a pass is now guaranteed to get added to WIP if received vs. having to go through the sked list first. · Added a "wipbusy" setting that allows you to specify a number of minutes to set the busy timer to when you accept WIP. · Made the Lookup window select (if possible) the line that matches the current station, grids, etc. · Made band changes in the Pass and Sked windows look up the last operating frequency used on that band. · Moved the keyer out of the main program to allow its use stand-alone without logging with RoverLog and to improve performance. · Removed the keyer options from inied.tcl and move them to default.rlk. · Added the ability for operators to select their own voice keyer setup and save it so that when operators switch they can switch "profiles". This will also allow rovers to set up ahead of time for different grids and switch grid profiles after moving. 2004-09-01 - Version 1_9_2 is now available. · Made quicksked and quicknet options to switch focus to Call Entry on Main Window after Sked and Net use. · Removed skedfreq option. This is taken care of by the frequency list. 2004-08-?? - Version 1_9_1 is now available. · Fixed spacebar behavior in call and recd fields. Spacebar now toggles you between these fields whereas Tab and Shift-Tab send you through all fields as normal. · Made Linux and Darwin platforms skip setting the icon for windows on all applications. · Reverted roverlog.tcl back to using no CRs at the end of every line. Having CRs broke the Linux version. Either way is supported under Windows. · Made references to ::tcl_platform() global instead of local. 2004-08-26 - Version 1_9_0 is now available. · Instead of checking for blank replies from the GPS server, check for grid, date, and UTC syntax errors. This should prevent wacky results from getting into RoverLog's fields. · Made the Sked window have its own network peer instead of linking it with the Net window's field. · Prevent reinitializing Sked window fields when bringing up that window. · Made Net and Sked windows sticky upon pressing Enter instead of making them disappear. · Show what this station is sending in the Net messages log as well as showing what's received. · Heavily revamped the sked window for ease of use. · Added concept of Work In Progress (WIP), a location where skeds that have come due go until they are worked. · Added Alt-A shortcut that accepts the next WIP. · Added concept of Busy timer (in minutes) that can be set by a station to prevent anyone else from passing for a time. · WIP and Busy are shared across the network. · Heavily revamped networking for better maintainability. · Made many cosmetic improvements to most windows. · Overhauled the way the operating frequency is set and handled. Now, a zero port number in the rig setup will assume a manually entered operating frequency for that band. The rigctrl setting now goes away. · Included a .lup lookup database ported from EM, EN, FM, and FM data from VE2PIJ's active VHF people database. See http://pages.infinit.net/ve2pij/ for more info. 2004-06-12 - Version 1_8_7 is now available. · Added "Request Frequency" feature on startup and by button press on the Net window. 2004-06-11 - Version 1_8_6 is now available. This version is packaged with the new libsnack.dll file that matches freewrap561. Added some info to Help->About. Added libsnack.dll from Tcl/Tk 8.4.6 to package. Rig and GPS Server failures no longer wipe out previous information, and GPS Server failure falls back to setting date and time from PC Clock. 2004-06-08 - Version 1_8_5 is now available. This is not a major change from 1_8_4, but here it is anyway. Bundled RoverLog with freewrap561 (vs. old freewrap55). Made call entry-bound lookup wait for 2 characters to be entered before doing the lookup. Added a debug statement before the array search start in Do_Lookup to gauge delay of that step. 2004-02-04 - Version 1_8_4 is now available! Added a utility to generate contest-specific headers. Added example .ini files for Linux and updated docs. Corrected the "label" syntax error bug under Linux. Corrected a debug message in rig.tcl for FT-817. Corrected mode options in inied.tcl to work with Linux. Updated README.TXT to be more clear on serial ports. 2004-01-27 - Version 1_8_3 is now available! Added Yaesu FT-817 support to rig.tcl. Needs test. Corrected shortcut text for Alt-Key-b (Bandlock). Added Alt-Key-j binding to Move Rotor. Made space work similar to tab in call and recd. Made network send to "all" skip peer entries that are blank or have zero for the port number. Made adding or deleting a sked advance you to the next time slot afterwards. Added creation of desktop shortcut to installer. Fixed some time lags by disabling debugging. Added basic.ini files that are abbreviated for more common setups. Allow selection of IP address for connection to GPS and Rotor servers. This allows one server to serve multiple RoverLogs on a network. Made Shortcuts help window smaller and added scrollbar. Made grid/QSOs list in Score window span columns to make that window less tall on the screen. Made default font size 8 instead of 10. See above. Only redraw lookup window if it is open at the time. This should improve lag a lot. Recent entries in the log from another peer are colored gray instead of the default black. Added "Send Skeds" button to Net window to refresh skeds on other peer stations. 2004-01-22 - Version 1_8_2 is now available! The installer now creates Start Menu shortcuts for the rest of the RoverLog utilities and servers. 2004-01-22 - Version 1_8_1 is now available! Now the windows distribution is packaged in a clean self-installing executable, yet is still small! Revamped skeduling completely. It should be a lot easier to use now. Made it so duplicate entries are allowed in the lookup file when loading. Fields are now concatenated in the lookupgrid and lookupband databases. Made it so you can do a partial lookup without having worked a station before (i.e. from the lookupgrid database. When loading the lookup database, use 6-digit grids to replace existing identical 4-digit grids, but not vice-versa. Made passing more user friendly. Don't just send a message, bring up the sked window. Handle pass freqs well too. 2004-01-15 - Version 1_7_2 is now available. Corrected "clock scan" error when adding a sked. 2003-10-13 - Version 1_7_1 is now available. Please read the README.TXT file before installing if you are upgrading from 1_5_7 or earlier. Corrected rotor.ini and rig.ini syntax errors. Removed line setting hidden file attribute on the .roverlog_state.tcl file to prevent *NIX problems. Changed all serial port mode strings to lower case (i.e. n,8,1 instead of N,8,1) to prevent *NIX problems. Made rig.tcl frequency display format consistent with 4 decimal places. Added support for Hygain DCU-1 rotor controller. 2003-10-13 - Version 1_7_0 is now available. · Added a rotor control server and Calc "Move Rotor" button. This works with the RC2800DC rotor for now. Need to find out what other rotors people are using to know what to add. 2003-10-13 - Version 1_6_0 is now available. · Added bands and notes to lookup file and window. · Save window locations/states on exit, restore on start. · Added a score indicator on the main window. · Added "Save Settings" option under the Tools menu to saving all user settings to roverlog.ini. 2003-09-08 - Version 1_5_7 is now available. · Added keyerttycontrol option to allow control of desired handshaking lines for keyer serial port. · Added serttycontrol option to rig.tcl to allow powering widget circuits off the serial port by turning on RTS, DTR, and/or other signals. · Added Yaesu FT-1000 support to rig.tcl. · Improved polling configuration for rig.tcl. · Made Update_Freq send every time it runs instead of only when the operating frequency changes. 2003-07-18 - Version 1_5_6 is now available. · Fixed key bindings to use legal names for Unix. · Fixed "-state readonly" references to check for 8.4 before executing. · Fixed sorting by call to ignore trailing "/" suffixes. · Made manual time entry warning configurable to prevent bugging after-the-fact loggers too much. 2003-06-19 - Version 1_5_5 is now available. · Made serial port control omit the -handshake option for OSX (Darwin) operating system. · Made inied.tcl descriptions more helpful. · Allow a different rig server for each band. The server can be started multiple times with different serial and IP ports. · Also, if the serial port is left empty, the server will not attempt to communicate with a rig. Instead, you can enter the frequency (for testing). · Warn the user after logging a QSO with manual time mode. · Change default GPS IP Port to 32123 to put it in the range allowed for non-well-known ports. · Change default Rig IP Port to 32124. See above. · Fixed rig and gps serial port close routines to protect against trying to close a port that has already been closed. · Fixed merge function so that headers are not duplicated in the log. Yikes, that was a bad one! · Do dupe checking when tabbing out of the call field. · Removed Alt-Spacebar mapping because it conflicts with Windows. · Fixed F10 mapping to raise the main window as well as bring focus to the call entry. · Mapped Alt-Key-F4 to hide the current window. · When QSYing, do not redraw map unless displayed (makes changing bands A LOT faster, hopefully obviating the need to make Alt-B bring down a menu for band changes. 2003-05-16 - Version 1_5_3 is now available. · Added periodic polling for Non-Icom rigs to rig.tcl. · Added "freq!" command to rig.tcl to allow remote control via TCP/IP. · Fixed time and date setting routines in gps.tcl. Service was interrupted due to another power outage about a week ago. I apologize for the inconvenience. Our power is now back on following an outage due to the ice storm here. 2003-03-04 - Version 1_5_2 is now available. · Made changes to the gps and rig servers to make them more robust. · Added Yaesu and Kenwood rig interfacing to the rig server. 2003-02-18 - Version 1_5_1 is now available. · Added by-band LO frequencies. 2003-02-17 - Version 1_5_0 is now available. · Added partial window refresh on tab from sent, call, and recd fields. · Added Ctrl-F shortcut to select a network peer and bring up network window. · Adjusted convenience field selection to put the insertion point after the entry. · Check for valid band and mode when starting. · Dehighlight Copy QSO button if editing. · Re-added Cancel Edit button to return entry as was. · Made Calc window optionally contain a compass with declination. · Declination is obtained fromt the GPS server if enabled. · Made key releases in sent, call, and recd fields update calc and partial lookup. · Added all remaining keyer config items to keyer window. · Use RTS only for PTT. · Allow logging dupes again. · Reimplement callsign checking as none, lax, or strict where strict is the same as the previous call checking with the addition of US 1x1 calls, and lax is any combination of alphanumeric characters. 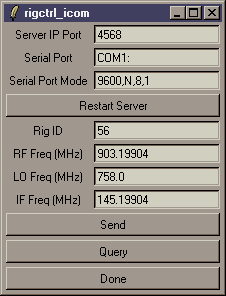 · Added rig control for most (5-byte frequency) Icom rigs. 2003-02-16 - Now I'm also working on rig control to be released in version 1_5_0 soon! 2003-01-23 - I'm working on a compass display. Let me know what you think. Maybe I should make an option to select between this and a rotor display. 2003-01-15 - Version 1_4_2 is now available. · Made voice keyer and cw keyer stop buttons stop both keyers to prevent confusion. · Fixed erroneous truncation of grids in lookup database. · Fixed inied.tcl to update the .ini file version. 2003-01-14 - Version 1_4_1 is now available. 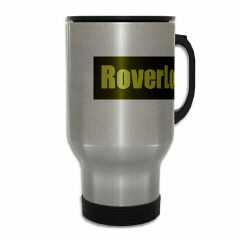 Please also consider supporting RoverLog by purchasing RoverLog Gear. · Fixed "Darwin" (OSX) startup to only skip selecting the mycall field and re-enable focusing on it. · Added mymode variable to allow starting with default mode. · Changed "L" to "LIGHT" in all .ini files and inied.tcl. · Check myband and mymode before setting from log. · Check to see if we got at least one QSO before trying to set info from last log entry. · Made Send Freq button send to all. · Added Alt-Key-space and F10 shortcuts to focus to Call field. · Made Tab from Sent field update calculator. · Added Alt-Key-[ and ] (also Page Down and Page Up) shortcuts to decrease and increase code speed. · Added default values to inied.tcl to prevent errors when variables are not set in roverlog.ini. · Converted all default networking port numbers to 3677, the new port assigned to RoverLog by IANA. 2002-10-11 - Version 1_4_0 is now available. Added an Ini File Editor and station frequency sharing. 2002-10-10 - I am working on an ini file editor. 2002-09-26 - Version 1_3_3 is now available. Added QSOs by Grid information to score window. 2002-09-25 - Version 1_3_2 is now available. · Fixed lookup grid access to include 4-digit grids. · Returned to obtaining field values from log after loading. · Made function keys perform keying from any window. · Perform better checking when attempting net operations to prevent can't read "peersindex" message. · Use local variables to prevent spurious band changes when receiving QSOs over the network. · Unlock score window for cutting and pasting. · Highlight the "mycall" field on start up to remind users to update mycall and sent grid. · Clear CW message 6 and net message after sending. · Made procedures to correctly set/unset time mode. 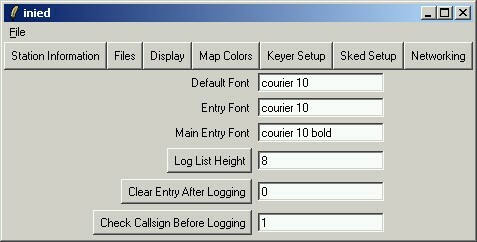 · Added Copy QSO button to get values from log to entry. · Changed callsign stack to operate more logically. · Allow upper case shortcut keys. 2002-09-17 - RoverLog used for September 2002 VHF Contest. 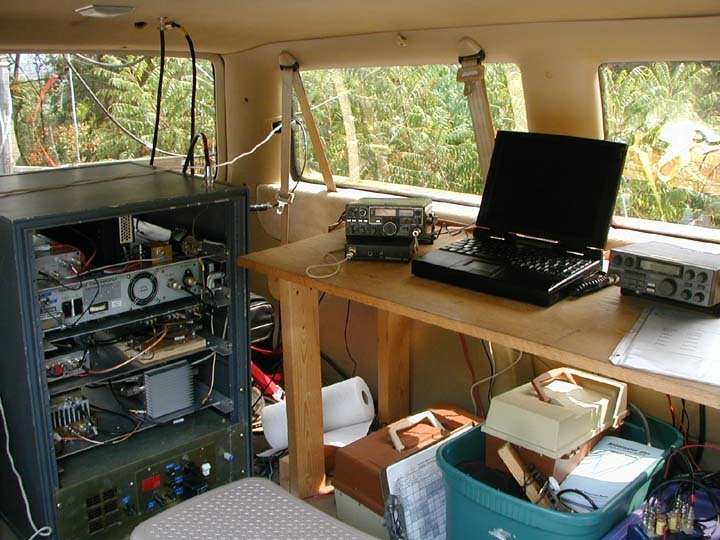 W2FU, KE3HT/R, N1FGY/R, and many others used RoverLog during the 2002 September VHF QSO Party. Here is a photo of KE3HT's station. Here's a photo by K2LM of N1FGY with a stunning hat. 2002-09-11 - God bless America, my home sweet home. Version 1_3_1 is now available. Go to the download page to get it. - Fixed faulty lookupgrid database operation. - Save lookupgrid database when done loading log. - Fixed bug when deleting first entry in the log. - Made key/dekey more robust to prevent lockup. - Added option stuff(netpopup) to allow focus-grabbing for network chat messages. - Allow broadcasting the log over the network. - Added bearing/distance calculation updates when logging a QSO or tabbing out of the received grid field. - Rearranged entry field focus sequence to the logical order. - Fixed excessive horizontal expansion of the log list scrollbar under Linux. - Fixed domain bug in bearing/distance calculation. - Made network broadcasting skip sending to self and continue through all peers even if one is down. - Made sked execution mark the sked as old instead of deleting it from the list. 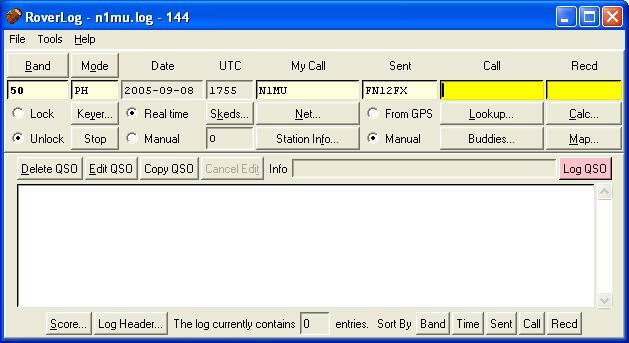 - Save log after receiving network QSO. 2002-09-04 - Version 1_3_0 is now available. Go to the download page to get it. - Save the log when the log header window is closed. - Do not lookup blanks. - Fixed summary claimed score for old rules. - Report when .ini file is not found. - Changed annunciator to be more obvious. - Sort skeds by time each time they change. 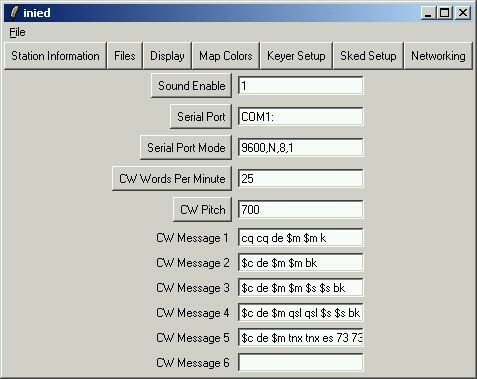 - Made CW keyer send text to serial device in addition audio. - Added band lock function to prevent changing bands. - Save after a log sort. - Make sure selection goes to next log entry after logging from edit mode. - Merged Lookup and Partial procedures internally and included bands. - Allow showing multiple sent/recd combinations for a single station in the partial lookup. - Made Lookup function get 6-digit grids for partial, lookup, and tab lookup. - Added external database lookup. 2002-08-16 - Version 1_2_4 is now available. Go to the download page to get it. · Fixed bug in To_LatLon that used the wrong 5th and 6th digits if only 4 digits were provided by the user. This would cause extremely erroneous results if the calculator was used with a 4 digit grid to/from a 6 digit grid. · Made option stuff(clearentry) to erase entry fields after logging a QSO. · Made the escape key stop the Keyer. · Made F1 through F9 play keyer messages. · Added metacharacters in CW strings and eliminated the need for an "Update Messages" button. · Added a .ini variable snd(enable) and a platform check for enabling/disabling sound. · Fixed a bug that caused new multipliers to fail to appear in the annunciator if the last QSO for that multiplier was deleted and then a new QSO was made. · Modularized access to the debug log to allow bypassing debug messages for code releases. I think this was causing sluggish performance. · Added a station stack that keeps a record of the five most recent calls and grids and allows rotating between them using Alt-Key-z. · Added version to roverlog.ini. It's not used yet, but it's there for external .ini file editors. 2002-07-26 - Added a few items to the RoverLog store. 2002-07-25 - Version 1_2_3 is now available. Go to the download page to get it. · Fixed bug in selecting a convenient field to return to when logging a QSO. · Added map color schemes. 2002-07-23 - Version 1_2_2 is now available. Go to the download page to get it. · Changed Update Messages button color to pink. · Added Cabrillo created by line to auto header. · Added handling in case two CW messages are sent at once. · Fixed sort by band to use stuff(bands) for order. · Fixed partial checking to eliminate duplicate listings when we've worked one station from many grids. · Make map cover the entire world. · Added valid callsign checking. · Added rover callsign checking. 2002-06-25 - Version 1_2_1 is now available. This fixes the bug causing spurious sked firings by returning to real time mode after entering a sked. Also new in this release: A WINDOWS EXECUTABLE THAT SHOULD ELIMINATE INSTALLING TCL/TK!!!. Windows users: please try it and let me know if it works for you. Go to the download page to get it. 2002-06-20 - Version 1_2_0 is now available. It adds voice and CW keying. Please try it out! · Add hot key for clearing the call and received grid (Alt-Key-q). 2002-06-17 - Version 1_1_0_pre is available for testing. It implements many of the features listed in the To Do section, but I still have to get to the network and file loading slowness issues. 2002-06-17 - Dana Rawding, N1OFZ, has made an OSX installer for RoverLog. Please visit http://dana.rawding.com/roverlog/. Also check out his config file editor while you are there. 2002-06-11 - RoverLog merchandise now available at http://www.cafepress.com/roverlog/. 2002-06-11 - Version 1_0_3 is now available. Fixed the stuff(bigfont) bug when starting without a declaration in roverlog.ini. 2002-06-10 - Version 1_0_2 is now available. Fixed the windows(my_station) bug when editing a QSO. 2002-06-10 - Version 1_0_1 is now available. Fixed sort by band function to work with 10 GHz too. Fixed problem when replacing an existing QSO where the variable stuff(editcall) was undefined. Fixed make sked function to leave time mode in manual when done so entering multiple skeds is easier. Allow changing call and grid from main window instead of in a separate box. This makes making skeds easier. Tab still makes the cursor go from UTC to Call for easier paper log copying. 2002-02-25 - Improved scheduling and added snoozing feature. Wrote user manual. Version 1_0_0 is now available!